Man-Made Diamonds > How Are They Made? Man-made diamonds are created by placing a 'seed' into a chamber of heat and pressure. This chamber mimics the natural growing process. Crystallization occurs allowing the diamond to mature within six to ten weeks. It is then cut, polished and graded by the same world renowned labs that certify earth mined diamonds. The following combination of techniques are most commonly used by laboratories. High Pressure, High Temperature (HPHT): A man-made diamond is produced in a laboratory or factory by mimicking the high pressure, high temperature conditions that form natural diamonds in the Earth. Within a growth chamber, a source of carbon dissolves in a molten metal, and carbon atoms travel through the metal to a small man-made or natural diamond seed to produce a distinctively shaped man-made diamond crystal. In HPHT synthesis, a press (left) applies extremely high pressures and temperatures to a central growth chamber that contains the necessary ingredient. This results in man-made diamond crystals with combinations of cubic and octahedral faces (center and right). 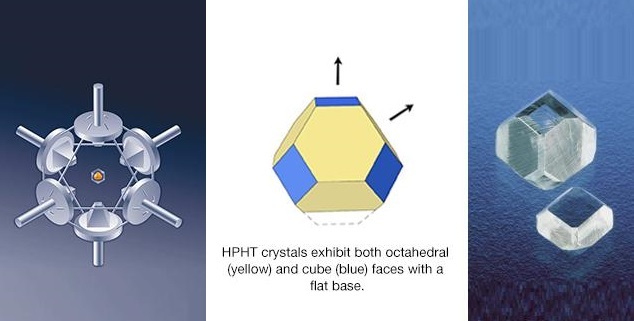 High-Pressure High-Temperature, or HPHT, recreates a diamond's natural growing environment found deep within the Earth. The machines used have the ability to build up the pressure of almost 60,000 atmospheres and temperature of 2,500 degrees Celsius. The growth cell contains all the elements needed to grow a diamond, including a seed, highly refined graphite and a catalyst mixture consisting of metals and powders. The cell is placed in the center of the HPHT chamber. Consistent temperatures reaching 1,300 degrees Celsius and more than 50,000 atmospheres of pressure are applied. The catalysts inside the cell are the first to react to the added heat and pressure and change from solid to molten form. The molten catalyst solution causes the graphite within the cell to dissolve. Once all the required conditions are met, the cooling process begins. This process takes place over several days and allows the carbon atoms to build upon the seed. The cell is removed from the HPHT machine once the growth cycle is complete. The new rough diamond is extracted and cleaned in preparation for final cutting and polishing. The entire HPHT growing process requires an incredibly controlled environment to produce a gem quality diamond. Any shift or change during growth can cause the diamond to stop growing or can create inclusions that result in unusable diamonds. Every diamond must complete the entire growth cycle before the machine can be opened. It is only after the HPHT chamber is opened that we can see the finished rough diamond and its color, clarity, and size. Bars Press - The Bars Press is the most effective tool used for producing gem quality diamonds. It uses a combination of inner and outer anvils to apply hydraulic pressure to the growth cell. Belt Press - The Belt Press is the founding technology behind growing diamonds. It can be large and produce several diamonds in only one cycle by using two large anvils that press together to create the necessary pressure. It is capable of producing gem quality diamonds but is most commonly used to produce diamonds and diamond powder for industrial purposes. Cubic Press - A Cubic Press can be large in size and uses six separate anvils to create the necessary pressure for diamond crystal growth. It is also used to create diamond powder for industrial purposes. Chemical Vapor Deposition (CVD): CVD is a process used to create gem grade diamonds as well as optics and semiconductors. The CVD process uses ultra-pure carbon-rich gasses in a controlled chamber. Carbon based gasses, such as methane, are heated until they break apart allowing the carbon atoms within the gas to separate. These tiny carbon atoms fall onto a diamond substrate and build up layers resulting in a rough diamond crystal. This process takes between six to ten weeks and yields gem grade, Type IIa diamonds. 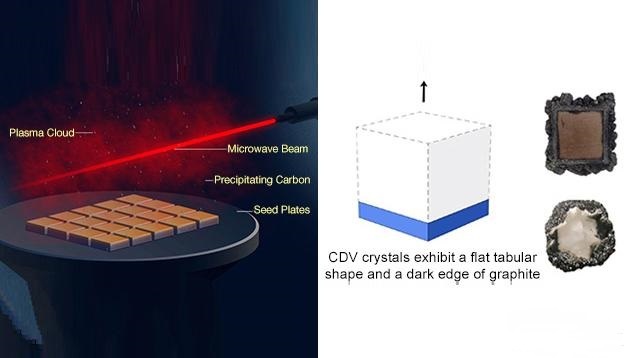 The CVD process involves breaking down the molecules of methane gas into carbon and hydrogen atoms, which then are deposited on diamond seeds to produce a square shaped, tabular man-made diamond crystal. In CVD synthesis, deposition of man-made diamond occurs from a carbon-rich gas onto a flat diamond seed surface. The man-made diamond grows in thin layers, and its final thickness depends on the amount of time allowed for growth (left). This results in flat, tabular crystals (center and right) with exteriors coated in black graphite crystals. Like natural diamonds, man-made diamonds can be subjected to treatments to change their color, or to improve their face-up appearance and clarity.